1 capsule 1 to 2 times daily. Daily, effective dose of L-Theanine usually amounts to 100-200mg and the increase of the intensity of the occurrence of alpha waves has been noted at the dose of 50 mg. Oral administration causes that after the time shorter than one hour, the compound reaches the brain and its increased level is maintained for another 5 hours, after which it drops. Because of this, the daily total dose should be divided into 2-3 portions and taken at even time intervals. In order to reach immediate effects (mental effort, relaxation), the preparation should be used at the total recommended dose, without dividing it into smaller doses. Thanks to its activity, l-theanine works well both in short and long perspective of use. 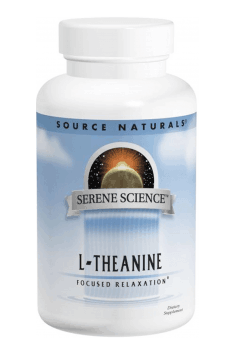 In order to improve cognitive abilities, it is recommended to combine the supplementation of L-theanine along with the substances demonstrating similar effect – levodopa, caffeine or Ginko Biloba. Combining the supplementation of L-theanine with EGCG (epigallocatechin gallate), 5-HTP, Bacopa Monnieri or Ashwagandha will strengthen their effect and positively influence the improvement of mood, the quality of relaxation and psychophysical functions. L-Theanine may be taken without any breaks for the whole year.